Salou is on the Spanish Costa Dorada in the region of Catalonia. It's a seaside town popular with tourists because of it's extensive array of bars and clubs. Apart from the excellent nightlife and several sandy beaches, the nearby Port Aventura theme park is the biggest attraction. Reus Airport is the main gateway. Ryanair flies to/from Alghero, Birmingham, Bournemouth, Bristol, Brussels-Charleroi, Dublin, East Midlands, Eindhoven, Frankfurt-Hahn, Glasgow-Prestwick, Liverpool, London-Luton, London-Stansted, Marrakech, Memmingen, Nador, Palma de Mallorca, Paris-Beauvais, Poznan, Santander, Santiago de Compostela, Seville and Weeze (near Düsseldorf). Thomas Cook Airlines and Thomson Airways have many flights to British destinations like Belfast, Cardiff, Leeds, Sheffield, Dublin, Aberdeen, London and Birmingham. Cork and Bucharest have direct flights as well to Reus Airport. Barcelona Airport (BCN) is the second biggest airport in Spain and the 9th biggest airport in Europe. It handles over 30 million of passengers every year and it is perfectly connected to the other main European airports by direct flights operated by either low cost airlines or regular ones. It is about 75 kilometres from Salou, or about an hour travel time. Undoubtedly one of the biggest attractions of this little town is the nightlife, and there are pubs, bars and clubs in abundance. If you have a few nights in Salou, the best approach is to wander the streets near the beachfront and look out for the best deals on drinks when you get there. There will be people trying to lure you into their venues with offers of free shots or cocktails, but this doesn't always guarantee it'll be a good place. 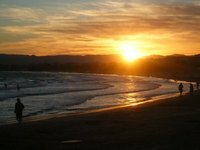 We have a comprehensive list of accommodation in Salou searchable right here on Travellerspoint. You can use our map to quickly compare budget, mid-range or top of the range accommodation in Salou and areas nearby. This is version 14. Last edited at 3:29 on Aug 2, 17 by sleepBot. 2 articles link to this page.